Leading Exporter of nitrile rubber gaskets and rubber nitrile gaskets from Coimbatore. Bhm Corporation is offering a comprehensive range of Nitrile Rubber Gaskets to its clients. We are engaged in manufacturing and exporting Rubber Nitrile Gaskets which are used in chemicals, steel, sewage and petroleum industries. 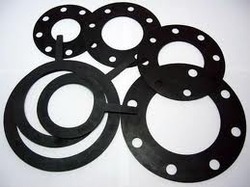 The offered gaskets are applied in gas compressors, reaction vessels, boilers, filters and reaction vessels. They are made available in various shapes and sizes. We are known for timely delivery of orders.